We have been talking quite a bit about metric units for measuring length and how you convert from mm to m, cm to m or mm to cm. 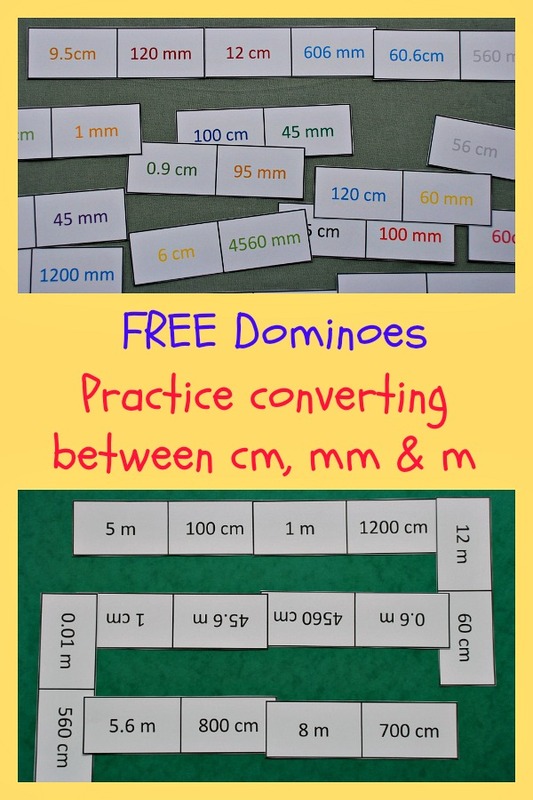 We did lots of hands on examples where the kids walked around the house and measured items in cm and then mm but I still wanted to find a way to practice moving between cm, mm and m. Both my kids love using Maths dominoes so I had a quick look to see if I could find something useful on the internet. But after a quick search I could not find what I wanted and I did not feel like spending ages searching so instead I decided I would try to create some of our own dominoes. Nothing fancy but just a way for the kids to practice and hopefully to cement when they need to divide/ multiple by 10, 100 or 1000. I kept ours straight forward with just black font for everything. And I tried to mix in a combination of easier examples with some harder ones. However 2 other home educating moms said it would be useful to have a colour version which the younger kids could use if they wanted. The idea being that the colours would help the kids – so 600 mm and 60 cm would be 1 colour and then 90 mm and 9cm would be in a different colour. So I also converted my exisiting dominoes into a colour version as well. Here are the dominoe sets that I created for the kids. I still want to create a complete set where the I mix converting between km, m, cm, and mm in one set – hopefully I will get that done soon. This entry was posted in Homeschooling and tagged educational resources, free printables, home ed, home education, homeschooling, maths activity, Maths Dominoes. Bookmark the permalink. What an excellent idea….should go a long way to help the children grasp the measurements.